Such testimonies come from young girls currently detained in Nauru, a remote island in the Pacific, which serves as one of Australia’s offshore detention centres for asylum seekers. The testimonies introduce us to the hardships endured by those who survived a dangerous journey at sea, but are dying slowly in a land where the living conditions have been described as cruel and appalling. 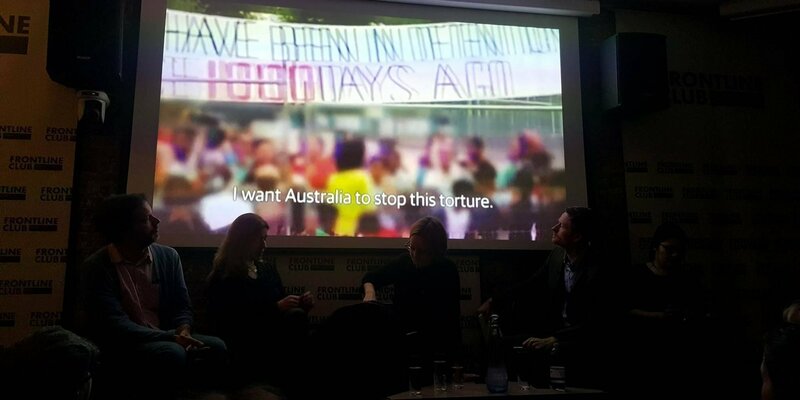 A panel of journalists, migration experts and human rights advocates gathered at the Frontline Club on 27 September to discuss the Nauru files leak, published by the Guardian in August. The files showcased evidence of child abuse, sexual assault, self-harm and suicide attempts, as well as poor living conditions inside the camp. The leak, which involved over 2,000 incident reports and is more than 8,000 pages long, sparked immediate international outrage. “I was unprepared for the level of horror that I saw there. And I don’t say these things lightly. I have been covering conflict in the last 15 years, working in places from Syria to Chechnya to Afghanistan. Ian Woolverton, deputy editor of Guardian Australia, said some of his journalists could not cope with the horrors they had seen on the island over the course of two years and as a result are now suffering from PTSD. In May, Omid Masoumali, an Iranian living in the Nauru detention centre for 3 years, set himself alight during a UNHCR visit. He stayed unattended for two hours before getting medical care. “What’s the point of surviving at sea if you die in here?” a refugee girl asked a Guardian journalist. Day in and day out, images of floating life jackets and drowning bodies fill our social media and reports of abuse and institutional negligence make global headlines. However, as the images of human pain and hopelessness have made it to our screens, the panel discussed: Have they really made it into our hearts and minds? Eiri Ohtani, Project Director of the Detention Forum in the UK, said the overwhelming flow of daily reports may be undermining how much we care. The panel agreed the Nauru files went largely under reported, especially in Australia. Ohtani said that human rights advocates and particularly journalists have an important role to play by changing the narrative that has formed around refugee-related issues, not only by giving these stories a face, but also by connecting them to a wider political landscape. Ohtari added that journalists should be very sensitive to the narrative of deserving versus undeserving migrants, which has been forming in the media. Neistat said that since coming back from Nauru only one journalist had asked her the most important question – who are these people? The Australian government defended their asylum policies by disregarding the documents as false or unverified, and by stating it was an issue for the Nauruan government, despite the Australian government hiring camp employees.